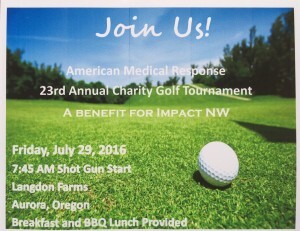 Join American Medical Response for their 23rd Annual Charity Golf Tournament to benefit Impact NW. Impact NW is a premier provider of educational and social services in the greater Portland metro area. The organization’s mission is to help people prosper through a community of support. Since 1966, Impact NW has been a leader in providing individuals of all ages with the skills and resources necessary to achieve success and to advocate for themselves and their communities. Annually, over 36,000 low-income children, youth, families, seniors, and adults with disabilities participate in Impact NW’s comprehensive programs. Please help Impact NW by becoming a sponsor for this fun and worthwhile event. All proceeds from the tournament will go directly to Impact NW.